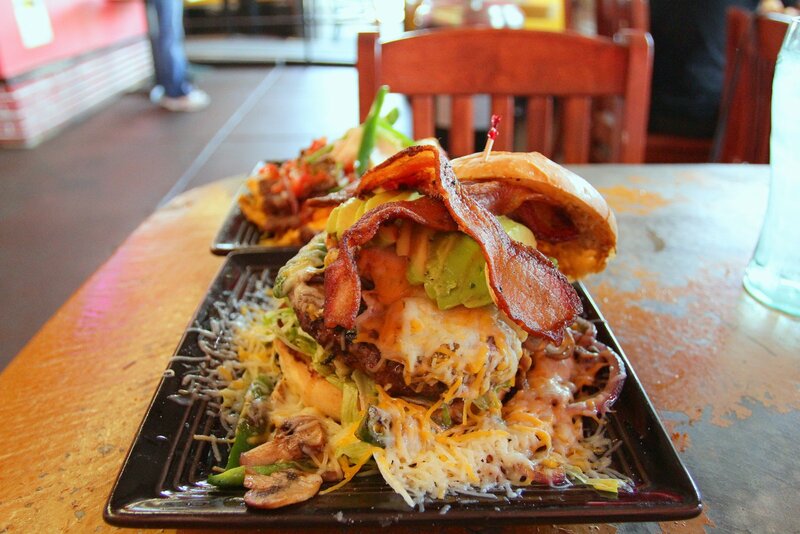 Flaming Grill Cafe is a local burger joint that you can only find in Sacramento, CA. 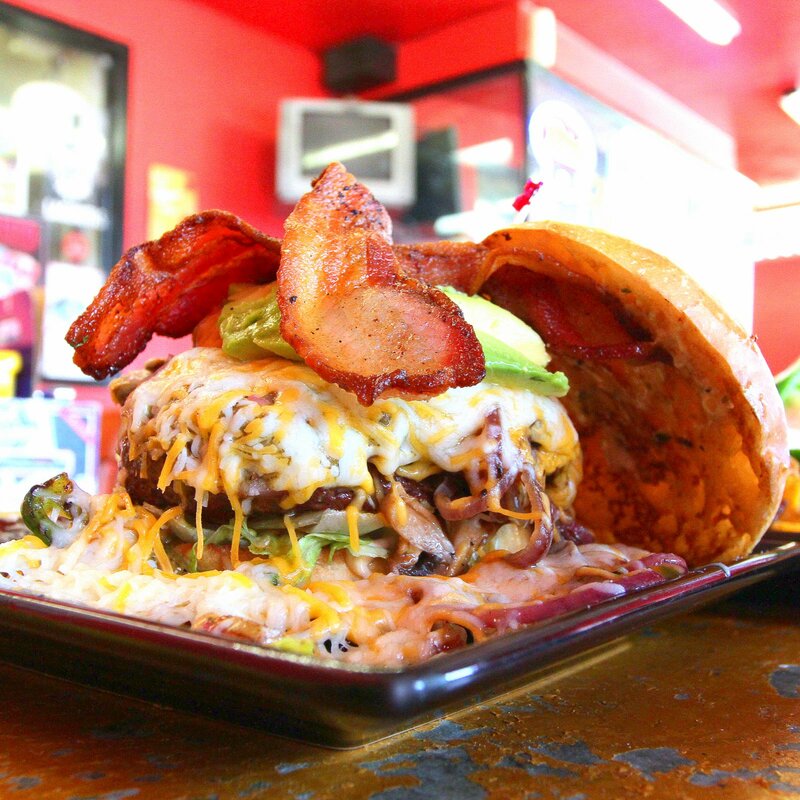 Although they have other items on the menu, their specialty is burgers. Big ones. 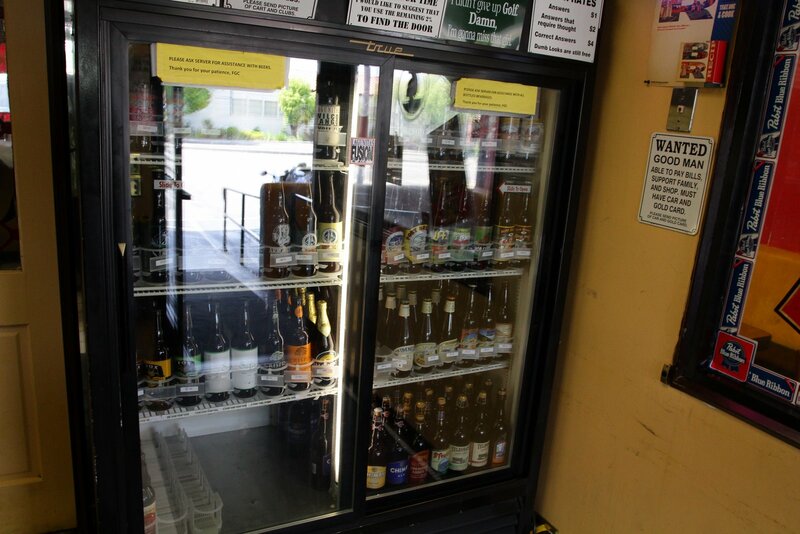 They also have a huge selection of micro brews, ciders and other drinks on tap to make sure your thirst is quenched as you take on their burger selection. 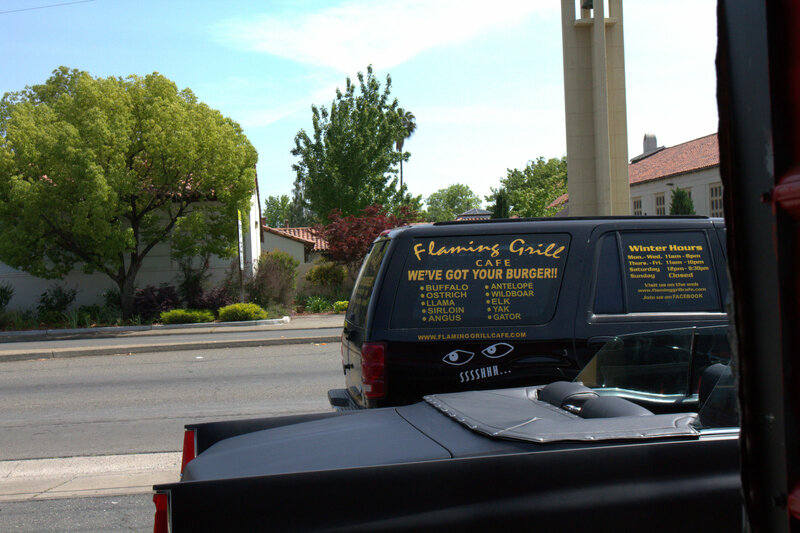 I can’t remember where I first heard about Flaming Grill. I think I first saw a photo of one of their burgers posted on Foodspotting. 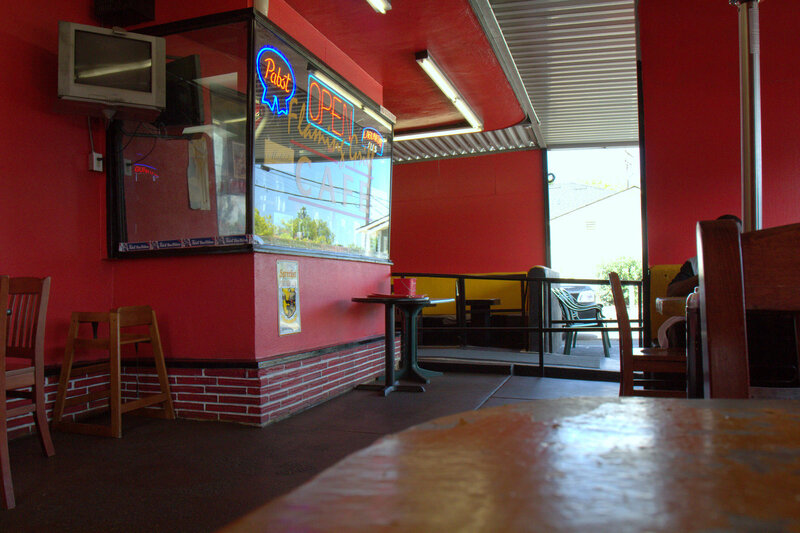 After that, it seemed like whenever the topic of burgers and Sacramento came up in conversation, Flaming Grill Cafe was inevitably mentioned. 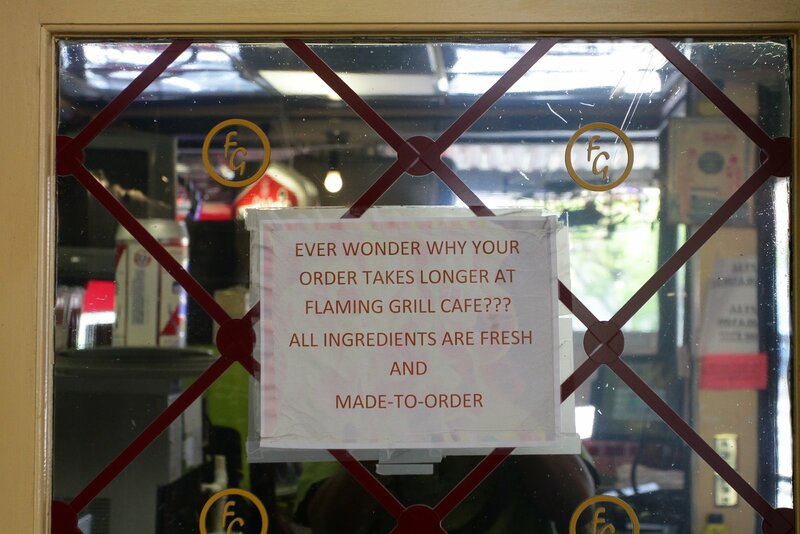 I probably heard “you’ve gotta try Flaming Grill” at least a dozen times. 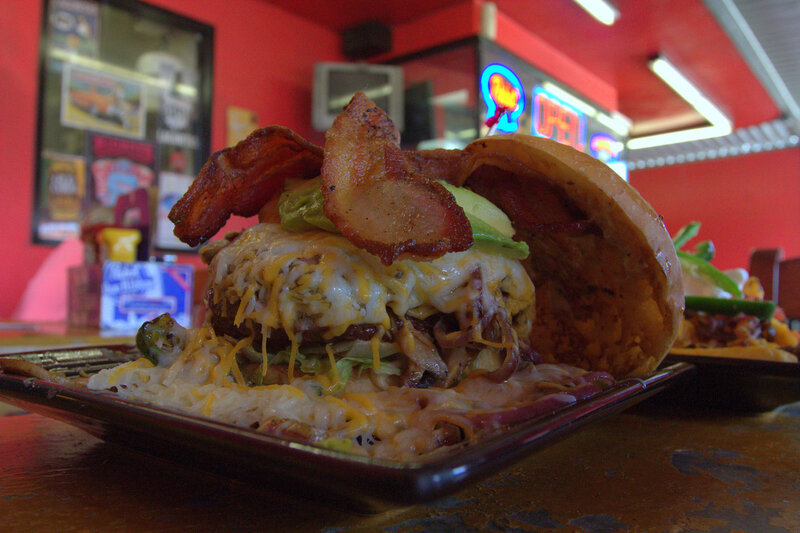 Since it’s National Hamburger Month (and #sacburgermonth), I thought May would be the perfect time for a first visit! 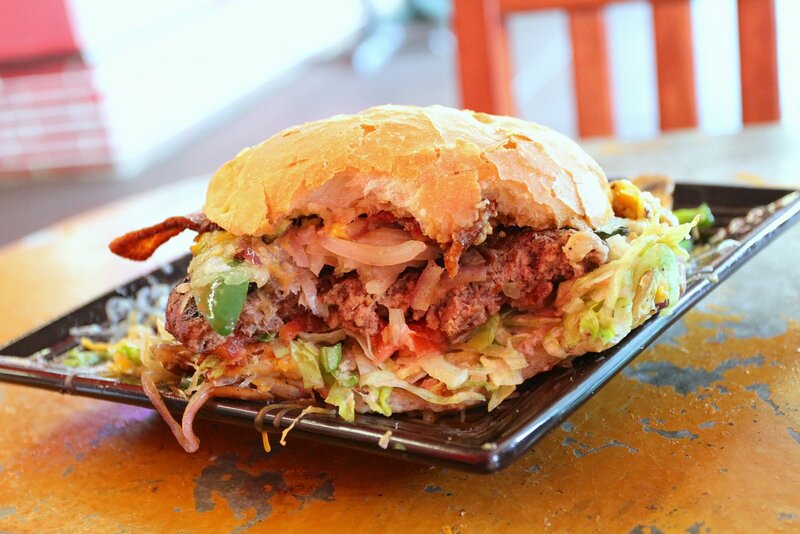 Saying there’s a wide variety of burgers available at Flaming Grill Cafe would be the understatement of the year. 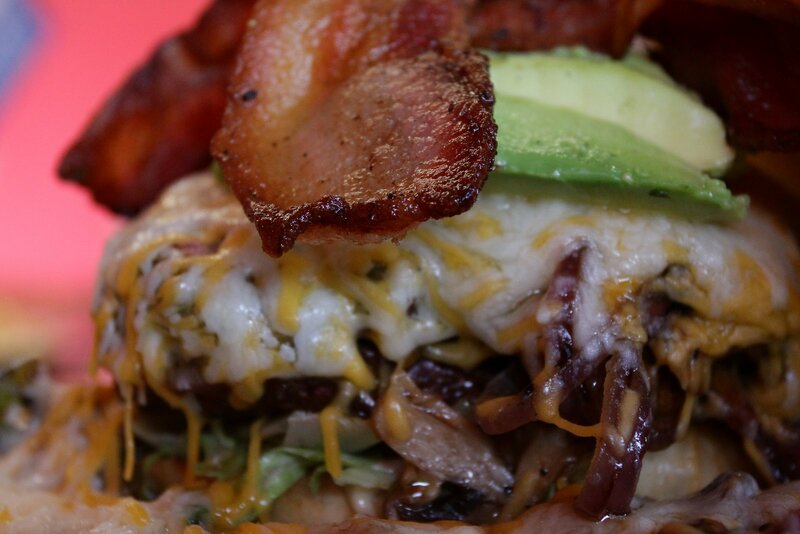 Sure, they’ve got your bacon cheeseburger, avocado cheeseburger, bbq cheeseburger standards, but what helps to set Flaming Grill Cafe apart are their “exotic” burger meat options. 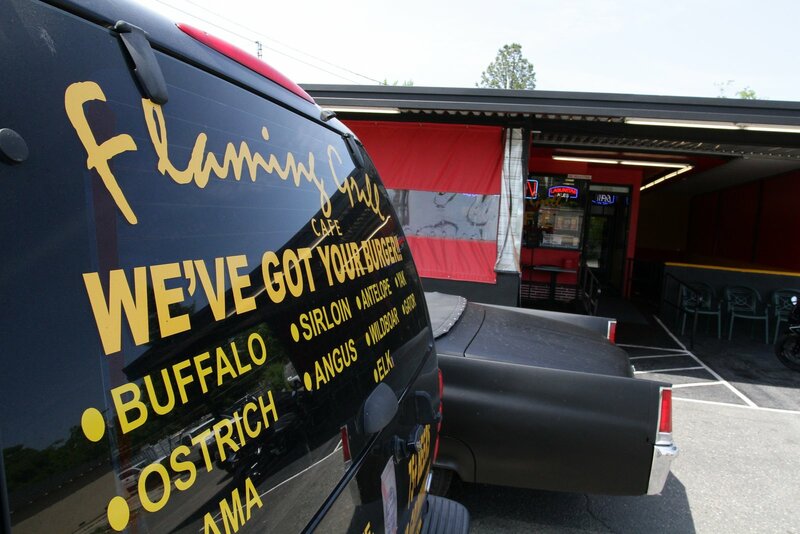 Their website shows no less than 10 meat options available including: sirloin beef, angus beef, elk, ostrich, buffalo, llama, alligator, wild boar, yak, and kobe beef. I’ve also heard that they often have even more rare specialty burgers like the “lion burger”. Yes, made out of the king of beasts! I ordered a “Hoser’s Monster Burger” and opted for sirloin beef. I love when a place is so confident about their food that they tell you right up front that they only offer it one way. 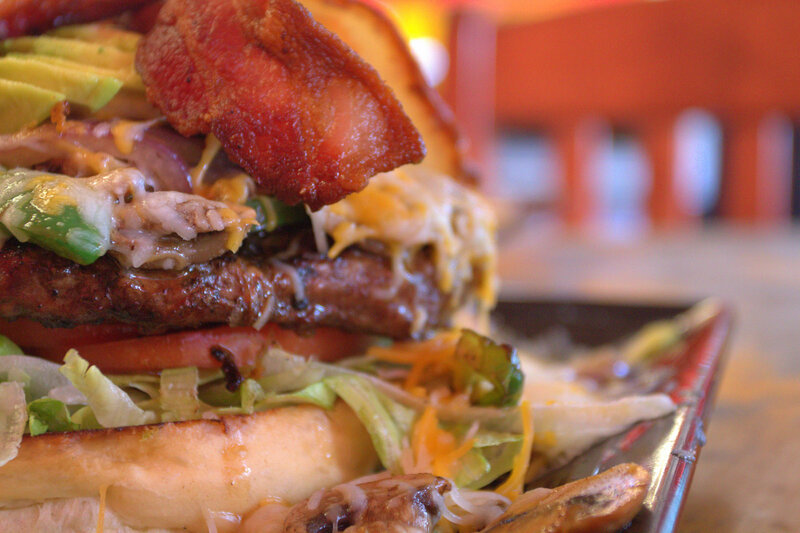 There are no substitutions or modifications allowed when you order Hoser’s Monster Burger. You can let them know how you want your meat cooked, but none of that “no avocado, hold the mayo” stuff on this particular burger. You can tell that Hoser wants had a specific vision in mind when he created this burger and he wants you to love it or hate it based on what he dreamed up. 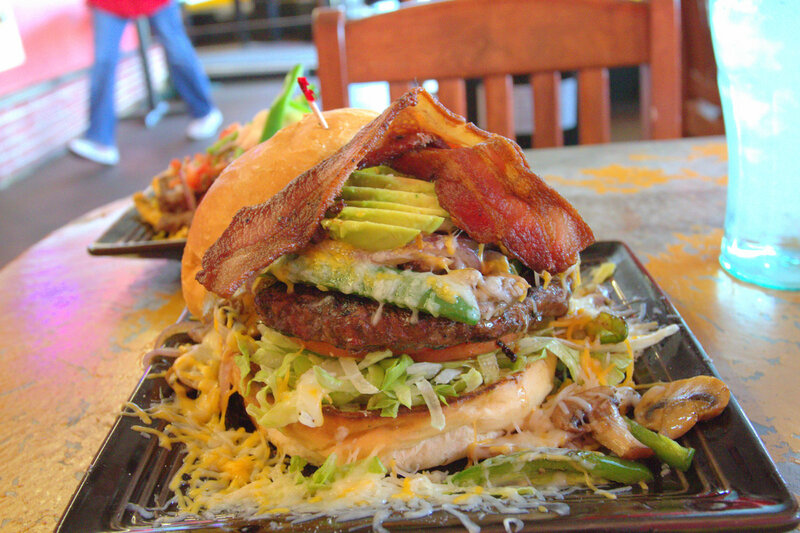 This burger is quite the dream too; boasting a bountiful list of ingredients: cheddar & jack cheeses, mushrooms, bacon, avocado, jalapeños, poblano peppers, onions, tomato, lettuce, and a VERY HOT homemade habanero sauce. 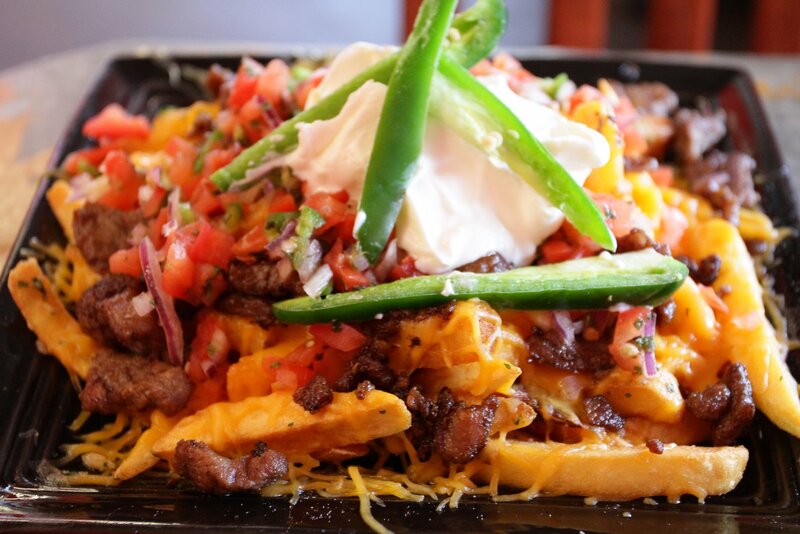 It comes with a side of carne asada fries just in case your belly hasn’t burst from the burger. I ordered mine medium rare and right away I could see why they call it a monster. 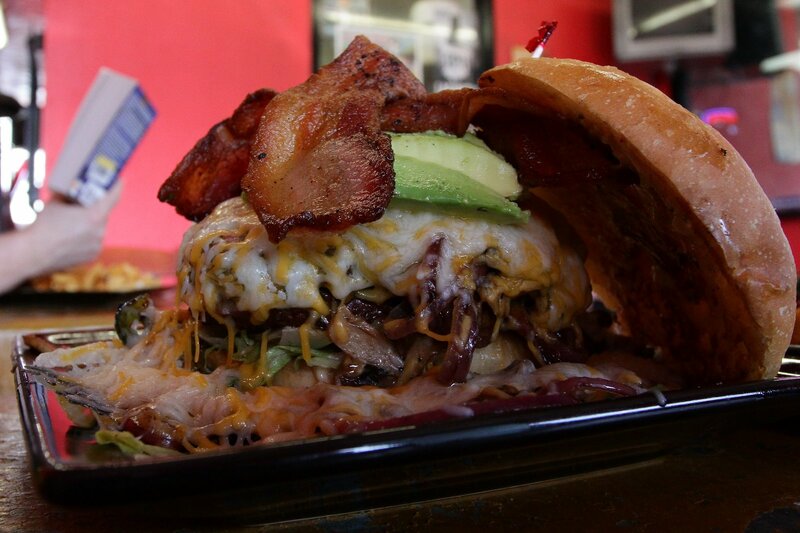 The cheese and mushroom surrounded the humongous hamburger like tasty tentacles. The whole thing was stacked so high with toppings that I had to get a ladder to take an overhead shot. I heard a guy at the next table over talking about how spicy the burger was, so I slow played the burger by crushing a few of the carne asada fries first. 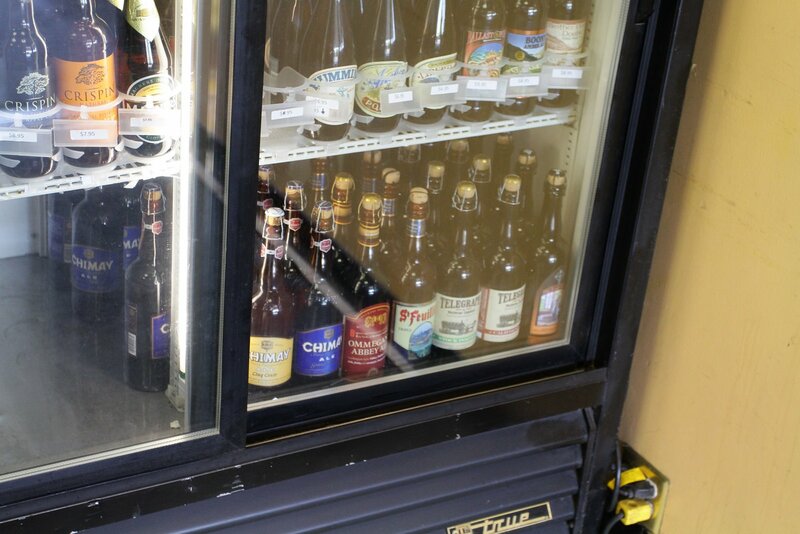 I could only put it off for so long before I had to dive in! The burger was cooked to a nice medium rare and each bite was like a menagerie of flavors in your mouth. 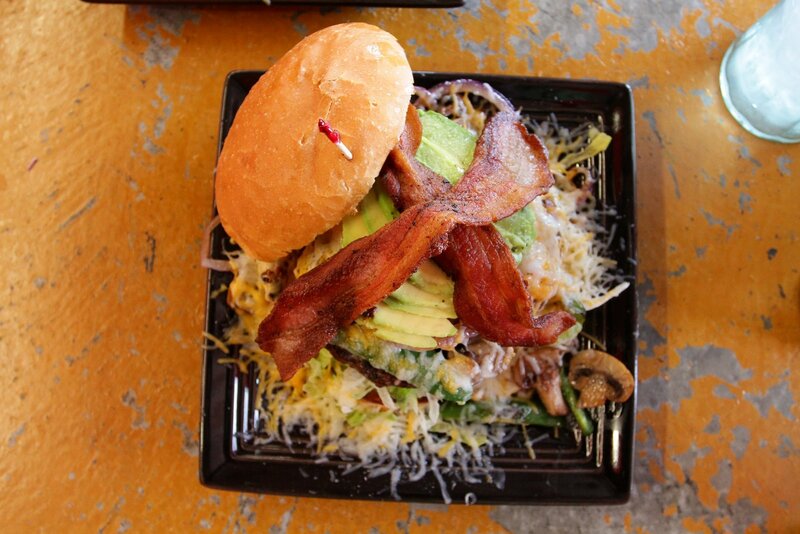 The saltiness of the bacon, the fresh lettuce and tomato, coupled with the spicy kick of the jalapeño and poblano peppers that were cooled slightly by the creamy avocado and cheeses. 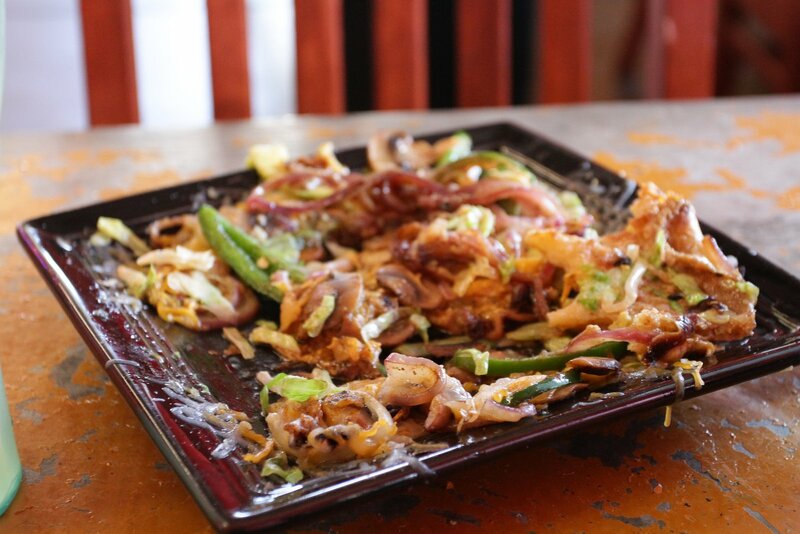 Just when you thought you were safe from the heat of the jalapenos, the fiery habanero mayo served as a reminder of why they put the letters VERY HOT in bold red letters on the menu. The only downside was the bun that, while fresh and tasty, just wasn’t able to handle the load of the monster. If they allowed substitutions, I think I would try it again with something it bit stronger like a French Roll. 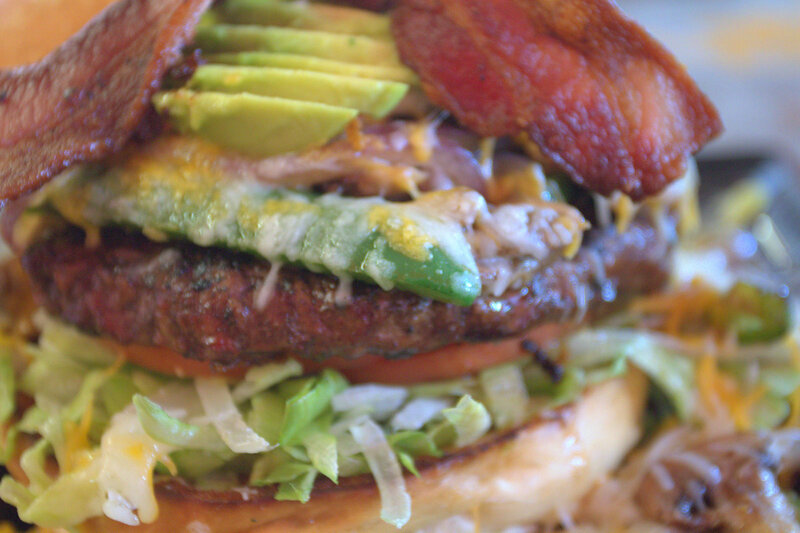 If I had to name this burger after a singer, I’d call it a Jason Mraz burger because it was such a beautiful mess. Each of the flavors sang in unison to make it a sandwich worth craving. I had a great burger experience at the Flaming Grill Cafe. 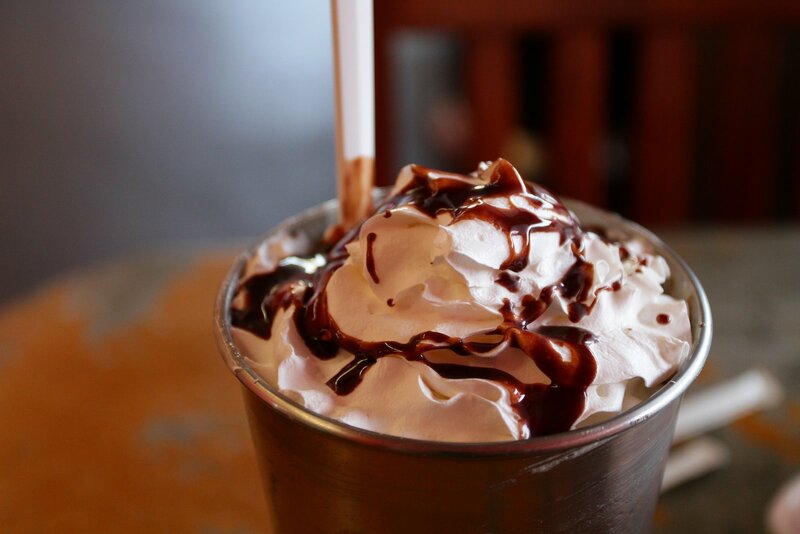 I loved the outdoor style seating, the huge drink selection and of course, the burger! There were a few other burger lovers eating there at different tables around the same time I was there and they were all super friendly. Normally I don’t like avocado on my burgers, and if it wasn’t for my semi-resolution this year to try the food exactly as the chef envisioned it (without substitutions), I wouldn’t have even ordered this burger. I was feeling adventurous and it paid off. The avocado worked on this burger to help with the heat and I’ll definitely be back to try another burger or two from the menu.